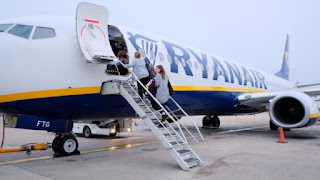 Cabin crew at Ryanair based in Italy, Portugal, Spain and Belgium say they will strike in late July. Cabin crew in Italy will go on strike for 24-hours on 25 July, while crew in Spain, Portugal and Belgium will strike for 48 hours on 25-26 July. Unions said further action may follow if the Irish airline does not make concessions on some employment terms. On Wednesday the unions issued a list of changes they wanted to their terms and conditions. They include a request to be paid into bank accounts in their own countries, rather than in the Republic of Ireland. Earlier this week, pilots directly employed by Ryanair and who are members of its Irish trade union said they would will go on strike for the first time on 12 July.